Lt. Col. (Dr.) Chad Hivnor, 59th Medical Specialty Squadron, Joint Base San Antonio-Lackland, Texas, is helping wounded warriors regain strength and confidence with a new approach — lasers. 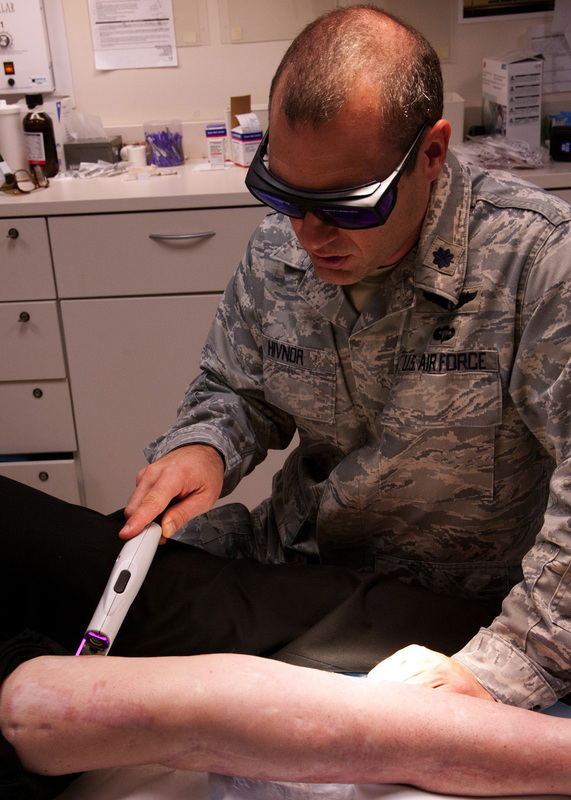 Hivnor will receive the Air Force Association’s Paul W. Myers Award for his work using pulsed dye lasers and carbon dioxide fractional lasers to improve skin conditions on wounded warriors, according to a release. He is also the only dermatologist in the Air Force taking patients to the operating room to treat severe burns that involves anywhere from 10 to 80 percent of their body surface area. “By using a carbon dioxide laser, a number of wounded warriors were able to be treated for their burns and scars, to include leg amputations,” Hivnor said in the release. Essentially, the lasers help decrease redness, and improve skin texture and flexibility on a wounded warrior’s scarred body. Hivnor was awarded a $1.1 million grant to study improvement in range of motion using lasers on burn and amputee scars. He worked alongside Massachusetts General Hospital and Shriner’s Hospital of Boston physicians during the joint research project. For four years, Hivnor switched between facilitating as the program director or assistant program director for the largest Defense Department dermatology residency, with 21 residents annually. The Paul W. Myers award is presented to the Air Force medical corps officer who has made the most significant contribution to the continued good health of the men and women of the Air Force. Hivnor will receive the award at the Air Force Association’s annual Air & Space Conference and Technology Exposition outside Washington, D.C., on Sept. 16.